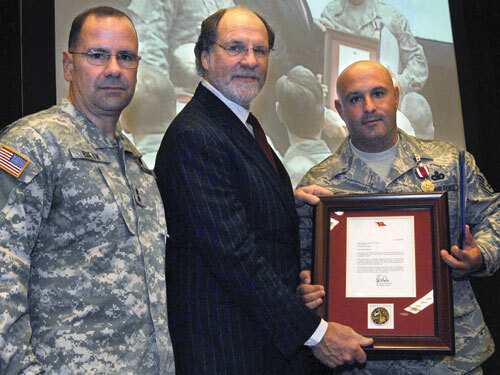 Governor Jon S. Corzine (center) and Maj. Gen. Glenn K. Rieth (left),The Adjutant General of New Jersey, present Master Sgt. Daniel T. Mitchell Jr. (right), Security Forces, 177th Fighter Wing, the Meritorious Service Medal for his service in Afghanistan. Photo by Kryn P. Westhoven, NJDMAVA/PA. Thank you…two simple words that cannot be said enough for the dedication and service of all the men and women of the New Jersey National Guard. In this post 9-11 world our Citizen Soldiers and Airmen have been asked to do more than ever before. Missions that were unimaginable just a few years ago have become routine for our National Guard. From providing security at bridges, tunnels, airports and nuclear power plants, to serving across the world in the Global War on Terrorism; you have performed every mission this state and nation has asked you to do with excellence and professionalism. The founding fathers would not recognize the state militias that won our independence so many years ago, except for one key element; you continue to serve your fellow state residents first and foremost. The citizens of New Jersey praise your service to this state and the nation. Let me say Thank You again, but this time to your families and employers, because without their support you would not be able to serve. The sacrifices that you, your family and your employer have made over the years are unfathomable. To have a father or mother, husband or wife, son or daughter be away for months at a time has to be difficult and I must say most people do not fully appreciate that level of personal sacrifice. In the years ahead the Soldiers and Airmen of New Jersey will continue to be a vital part of New Jersey’s homeland security and this nations defense again terrorism. I am proud to be the Commander-in-Chief of this Hometown Team. It is with a firm appreciation for all that you do each and every day to make this state and nation safer places, that I once more say Thank You for your service.